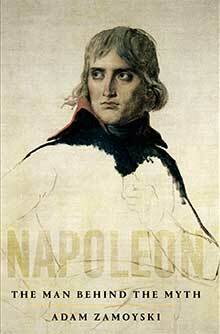 Napoleon inspires passionately held and violently conflicting visions. Was he a god-like genius, Romantic avatar, megalomaniac monster or just a nasty little dictator? He was none of these things. 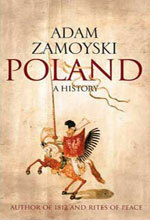 He was a man, and as Adam Zamoyski presents him in this landmark biography, in many ways a rather ordinary man at that. He possessed almost superhuman qualities and talents, but it is hard to credit genius to a general who presided over the worst (and self-inflicted) disaster in military history and who single-handedly destroyed the great enterprise of rebuilding a strong France which he and others had toiled so hard to achieve. A protean organiser and legislator whose charisma mobilised millions, he did leave an impressive array of laws and institutions which survive to this day, but perhaps his most persistent legacy is the self-serving legend he painstakingly crafted. But he was no evil monster. He could be selfish and violent, but there is no evidence of him wishing to inflict suffering gratuitously. His motives were mostly praiseworthy and his ambition no greater than that of contemporaries such as Alexander I of Russia, Wellington, Nelson, Bernadotte and many more. What made his ambition exceptional was the scope it was accorded by circumstance. Adam Zamoyski strips away the lacquer of prejudice, explodes accepted myths and debunks long-held assumptions to reveal a more human, more understandable and far more interesting Napoleon. He places him firmly within the context of his times, showing how in the 1790s, this provincial youth was propelled into a political scene racked by revolution and a world at war. His insecurities, social, physical and sexual – turned his struggle for survival into a self-perpetuating quest for acceptance through the pursuit of ever greater power, which led to his final defeat in 1815. Based on primary sources in many European languages, and beautifully illustrated with portraits done only from life, this magnificent book examines how Napoleone Buonaparte, the boy from Corsica, became ‘Napoleon’; how he achieved what he did, and how it came about that he undid it. 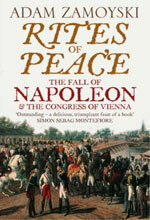 It does not justify or condemn but seeks instead to understand Napoleon’s extraordinary trajectory. Faced by this apparently occult threat, they resorted to repression on an unprecedented scale, expanding police and spy networks in the process. Napoleon managed to contain the revolutionary elements in France and those parts of Europe he controlled, but while many welcome this others saw in him no more than the spawn of the Revolution, propagating its doctrines by other means. After his defeat at Waterloo in 1815, the victors united in a Concert of Europe dedicated to the maintenance of the old order, the suppression of all opposition, and the ferreting out of the conspirators whom they believed to be plotting mayhem and murder in the shadows. 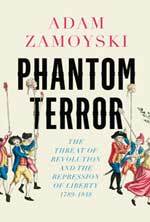 In this groundbreaking study, bestselling historian Adam Zamoyski exposes how the rulers of Europe resorted to a pusillanimous yet cynical use of the police spy and the bayonet, which only intensified their own fears and pushed ordinary people towards subversion, building up the pressure of opposition to their rule. This compelling history, occasionally chilling and often hilarious, tells us a great deal about how the modern state evolved through the expansion of its organs of control, and holds urgent lessons for today. Few composers elicit such strong emotions as Chopin. Few have been more revered and cherished. And few had had so much sentimental nonsense written about them. 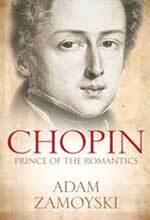 Adam Zamoyski’s compelling new biography cuts through the mass of anecdote and myth that has sprung up around the composer’s life and the ebullient and striking personalities of Romantic Paris among whom he lived, which included Liszt, Berlioz, Victor Hugo and George Sand, in search of the real Chopin. Zamoyski brings to the subject an unrivalled knowledge of the historical, social and cultural background of the composer’s native Poland as well as of the France in which he spent most of his creative life. He has scoured the archives of Warsaw, Krakow, Paris and London in his quest for the truth, and has based his account exclusively on primary sources and contemporary accounts. The result is a biography of authority, perception and wit. Chopin emerges from the sugary romantic mist in which he has been shrouded as a real, palpable personality, a man of intelligence and humour; in music and innovator of genius; in business a feckless spendthrift; in love hesitatnt and tender; in friendship passionately loyal but often intolerably exacting. Through a close reading of his letters and the use of everyday detail, Zamoyski draws the reader into the private world of this most complicated and reticent of men – ‘a man made for intimacy’, as the poet Heinrich Heine called him – and reveals the real passion, suffering and ultimate tragedy of his life. Although the election of Karol Wojtyła as Pope John Paul II and the dramatic rise of Solidarność had brought Poland into the world’s consciousness, it was not until the collapse of the Soviet empire in 1989 that it returned to life as an independent political entity. Yet few people outside the country had any idea that it had ever been one in the past. No nation’s history has been so distorted as that of Poland. In 1797 Russia, Prussia and Austria divided the country up among themselves, rewriting history to give the impression that Poland had never been a fully sovereign state, only a backwater that needed civilising. In fact the country they had wiped off the map had been one of the largest and most richly varied in Europe, embracing a wide variety of cultural and religious traditions, accommodated within one of the boldest constitutional experiments ever attempted. Its destruction created an imbalance and initiated a series of struggles that culminated in the two world wars and the Cold War. Today, after the turmoil of the past two centuries, Poland has re-emerged as one of the most homogenous and vibrant nations of Europe. Adam Zamoyski’s comprehensive but succinct and witty account of her thousand-year history goes a long way to explain how this has come about. In the summer of 1920, outside the gates of Warsaw, there took place a battle that ranks alongside Marathon and Waterloo for its influence on the course of history. Yet, dramatic as it was and fateful though its consequences were, the story of how Lenin came within a hair’s breadth of shattering the Versailles peace settlement and spreading Bolshevism from Russia to western Europe has been largely forgotten. In 1920 the new Soviet state was a mess, exhausted by a bloody civil war. The best way of ensuring its survival appeared to be to export the revolution to Germany, itself economically ruined by defeat in World War I and racked by internal dissension. Between Russia and Germany lay Poland, only recently restored to independence, and determined to hold on to it. But Poland was weak and her allies Britain and France, themselves fearful of social revolution, were in no position to help. Adam Zamoyski describes how – in what became known as the ‘Miracle on the Vistula’ – the Polish army, led by self-taught general and former terrorist Józef Piłsudski achieved at the last minute one of the most decisive victories in military history, in which aeroplanes proved useless and tanks were swamped by swirling masses of cossacks and lancers in scenes reminiscent of the Napoleonic wars. 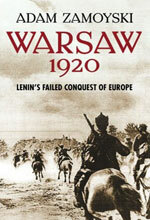 The shattering defeat his armies suffered in the battle for Warsaw forced Lenin to settle for communism in one country, while another major actor in the events, Joseph Stalin, nursed a grudge and a longing for revenge that he would fulfil in 1939. In the wake of his disastrous Russian campaign of 1812, Napoleon’s imperious grip on Europe began to weaken, raising the question of how the Continent was to be reconstructed after his defeat. There were many who dreamed of a peace to end all wars, in which the interests of peoples as well as those of rulers would be taken into account. But what followed was an unseemly and at times brutal scramble for territory by the most powerful states, in which countries were traded as if they had been private estates and their inhabitants counted like cattle. The result, fixed at the Congress of Vienna in 1815, not only laid the foundations of the European world we know. It put in place a social order and a security system that remained in place until 1914. When that system fell apart, the tensions it had contained came to the fore with disastrous results, in the shape of rabid nationalism and militant socialism. The events described in this book therefore lie at the root of many of the problems that still dog the world today. Although the difining moments took place in Vienna, and the principal players included Tsar Alexander I of Russia, the Austrian Chancellor Metternich, the British Foreign Secretary Lord Castlereagh, the Duke of Wellington and the French master of diplomacy Talleyrand as well as Napoleon himself, the accepted view of a gathering of consummate statesmen reordering the Continent in elegant salons is a false one. Many of the crucial questions were decided on the battlefield or in squalid roadside cottages amid the vagaries of war. And the proceedings in Vienna itself were not as decorous as is usually represented. Drawing on a wide range of first-hand sources in six languages, which include not only official documents, private letters, diaries and first-hand accounts, but also the reports of police spies and informers, Adam Zamoyski gets below the thin veneer of courtliness and reveals that the new Europe was forged by men in thrall to fear, greed and lust, in an atmosphere of moral depravity in which sexual favours were traded as readily as provinces and the ‘souls’ who inhabited them. A chilling account, full of menace as well as frivolity. Napoleon’s invasion of Russia and the terrible retreat from Moscow were a military epic and a human tragedy on a colossal scale – history’s first example of total war. But the campaign of 1812 was not just a war on Russia: it was the climax of a long duel between two emperors for supremacy in Europe, between two vast empires, and two utterly alien cultures, and its outcome affected the course of the continent’s history over the next two centuries. Napoleon’s Grande Armée, the largest ever seen, had Spanish and Portuguese, Italians and Poles, Germans and Croats, Dutchmen and Swiss as well as Frenchmen in its ranks. He launched it into the huge expanses of Russia, where it could find neither food nor water. When the Russians finally made a stand at the gates of Moscow, the ensuing battle was a slaughter the lie of which would not be seen again until the first day of the Somme in 1916. The sufferings of the soldiers and their camp followers on the wintry retreat from Moscow are almost unbearable to read about. In this gripping and masterly account, Adam Zamoyski has drawn on the latest Russian research as well as a vast pool of first-hand accounts in French, Russian, German, Polish and Italian to paint a vivid picture of the experiences of soldiers and civilians on both sides of the conflict. 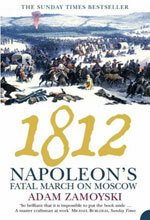 He charts the complex relationship between Napoleon and Tsar Alexander with great skill, and shows how it came to distort their alliance and bring about a war that neither wanted. There has been no lack of books on the 'Age of Revolution', on the rise of nationalism and on the birth of the modern world. But they have all been strongly marked by simplistic orthodoxies, such as the Marxist view that revolutions were an inevitable part of a great economic process. Or that upheavals took place because people were poor or hungry or downtrodden. These books resolutely ignore such inconvenient truths as that it was not the poor who made the revolutions. They also ignore any underlying spiritual and emotional forces at work. They make only the most superficial connections with the Romantic Movement in literature and the arts, and do not go into its deeply religious undertow. 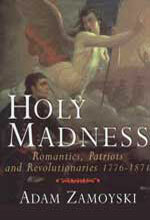 Holy Madness sets out to make some of these connections. It probes into the psyche that was responsible for so many of the founding events of our modern world, and into the instincts that inspired its most generous and most murderous impulses. This book explains how the Enlightenment dislodged Christianity from its central position in the life of European societies and how man's quest for ecstasy and transcendence flooded into areas such as the arts, spawning the Romantic movement. The religious themes in art gave way to political and social ones, and art, literature and music became substitute religions, offering solace and the possibility of attaining the sublime. In the late eighteenth and early nineteenth century this secular quest for salvation also invaded politics, giving rise to a widespread desire to bring into being ideal communities. This book traces how worship and dedication originally channelled through the church was refocused on the cause of the people and the nation. This dramatic journey which begins in America in 1776 and goes right up to the last agony of the Paris Commune in 1871, takes in the French revolution, the Irish rebellion, the Polish risings, the war of Greek liberation, the Russian insurrection, the Hungarian struggles for freedom, the liberation of South America, and the Italian Risorgimento. Generations of young men struggled and died in a kind of crusade whose Jerusalem was an idealised nation, death in the service of which brought martyrdom and redemption. On a vast canvas, Zamoyski combines a wonderfully illuminating and thought-provoking exploration of this fascinating theme with portraits of the key people involved: Lafayette, Garibaldi, Lamartine, Kossuth, Mazzini, Napoleon, Paine, Benjamin Franklin, Kościuszko, Coleridge, Byron, Mickiewicz, Bakunin, Rousseau, Wolfe Tone, Bolivar, Herzen and many others. 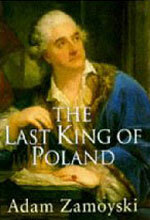 The last king of Poland owed his throne largely to his youthful romance with the future Catherine the Great of Russia. But Stanislaw Augustus was nobody's pawn. He was an ambitious, highly intelligent and complex character, a dashing figure in the finest eighteenth-century tradition, He was a perfect illustration of the contraditctions of Europe's ideological and religious viewpoints; he worshipped reason but was led by the heart; professed Catholicism but believed in Providence; toyed with the occult and practised freemasonry. A great believer in art and education, he spent fortunes on cultural projects, and finding that he was blocked politically by Catherine, he put his energies into a programme of social and artisitic regeneration. He transforemd the mood of his country and brought it to a new phase of reform and independence, culminating in the passing of the constitution in 1791, hailed in Britain, France and the United States as one of the greatest events of the century. Poland's neighbours, however, viewed this beacon of liberty in their midst with alarm, and as they invaded and partitioned it, Stanislaw was obliged to watch the destruction of his life's work, and ultimately forced to abdicate, a broken man, deceived and disillusioned. The Last King of Poland is the rich and enthralling story of a personal dream with all ethe elements of grand tragedy, and at the same time an important chronicle of the birth and death of liberalisn in Poland and the establishment of Russian power in Europe. The part played by the Poles in the air during the Second World War and the colourful stories of their doings have become part of British folklore. But very few people have any idea of the extent of their involvement, or how they came to be in Britain in the first place. More than 150 Polish pilots took part in the decisive phase of the Battle of Britain in 1940. By the beginning of 1941, there was a fully fledged Polish Air Force operating alongside the RAF. With 14 squadrons and support services, it was larger than the air forces of the Free French, Dutch, Belgians and all the other European Allies operating from Britain put together. Some 17,000 men and women passed through its ranks while it was stationed on British soil. They not only played a crucial part in the Battle of Britain, they also contributed significantly to the Allied war effort in the air overall, and took part in virtually every type of RAF operation, including the bombing of Germany, the Battle of the Atlantic and Special Operations. 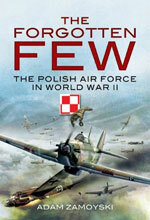 This book is not intended as a full history of the Polish Air Force. Nor does it pretend to assess the exact contriubtion of these men and women to the Allied cause. The intention is to give a picture of who they were, where they came from, how they got here and what they did. Also to take a look at their, at times, strained but ultimately successful collaboration with the RAF and their sometimes difficult, often notorious, but ultimately happy relationship with the British people. A final chapter recounts the fate of those who returned to Poland, where many faced Communist firing-squads, and of those who stayed behind to build a new life for themselves in Britian and other Western countries. 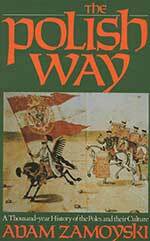 A lavishly illustrated history, from the tenth century to the present day, tells of Poland’s achievement as a European nation: a subject that has occupied historians far less than the woes that have beset her people. Here is a country that was one of the first in Europe to enshrine a measure of personal liberty in law, that was second only to Iceland in evolving a parliament. The Renaissance manifested itself much more strongly in Polish culture than in its neighbours’. Poland enjoyed religious peace while others were divided into the murderous factions of the Reformation and Counter Reformation. Its victories over Teutonic Knights, Tatars and Turks, and effortless conquest of Moscow, won it a reputation for a century and more as the most formidable military force in Europe. Its Constitution of 1791 lit a brief beacon for the liberal world, while sealing its own doom. Adam Zamoyski demonstrates the continuity underlying the apparently discontinuous history of the Polish people, and reveals much in Poland’s past that must be grasped for any understanding of what is happening in the country today – in parliamentary politics from the fourteenth to the eighteenth centuries, in the religious issues that have dominated public life, in Polish literature, art and architecture. The colour and monochrome illustrations, most of them published here for the first time outside Poland, provide a striking record of Polish attitudes and tastes, and illuminate that curious mixture of Eastern and Western influence which make up Polish culture. Hailed as a genius and national hero, likened to Einstein and Gandhi, Paderewski rose from provincial obscurity to become the most famous pianist in history – the twentieth century’s first superstar – as well as Prime Minister of Poland. For more than fifty years, until his death in 1941, he was a household name, and all over the world “Paddymania” was rife. Audiences swooned – at least a dozen ladies had to be “carried out in a fainting condition” when he performed in Edinburgh in 1894; he was mobbed in Paris, London and all over America, besieged with love letters and proposals of marriage. Critics eulogized – James Huneker found his playing “totally overwhelming”, and even George Bernard Shaw admitted that Paderewski’s musical “intelligence” permitted him to seize ten nuances in a composition for every one the average pianist picked out. Advertisers swore by him; the press explored minutest details of his life. Heads of state received him – he played for Queen Victoria at Windsor, and for Woodrow Wilson at the White House; he was admired by politicians from Lloyd George to Mussolini, by artists from Conrad to Burne-Jones and Saint-Saëns. Why then, after his death, did Paderewski come to be largely forgotten? 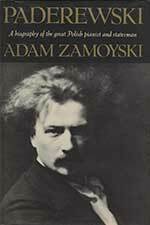 Adam Zamoyski sets out not only to reassess Paderewski’s achievements, but to revive, with the help of new research, the astonishing story of his life. It is a story with elements of both the fairy tale and the melodrama, in which – despite the trials of his early life, his chaotic musical education, his tragic first marriage, and the initial hostility of audiences and critics – Paderewski’s fanatical ambition to “do something for Poland” drives him to unprecedented success. Drawing on a wide range of contemporary sources, Zamoyski unravels facts from the legends that grew up around the pianist-statesman. He clarifies Paderewski’s extreme personality, his complex romantic life, his musical and political careers; and above all he attempts to solve the mystery of his undeniable, irresistible power.